There are so many of us landscape photographers that try or have a some kind of balance in our relationships. Some of us are gone for long periods of time or gone for just a few days but quite frequently. Many of us may feel we dont’ have the time because the important balance in life is spending time with the ones we love the most. Some of us have that special someone that doesn’t mind us leaving without notice and reappearing at random times but some of us might not have it so lucky. I have been in and out of few relationships during my love for landscape photography and in each relationship the constant leaving was dealt with in different ways. I found landscape photography before I found the right person for me and I was always curious to how I could make both work for me. In the past I was a weekend warrior type of photographer and my luck wasn’t the greatest when I tried to balance the two loves. One love always seemed to be a little heavier so my big fat camera unbalanced the scale a little too much. Now life has changed since weekend warrior days and I can arrange my scedule so I can see Christina during here time off of work, eventullay when we have kids I’ll have to make some more changes to balance out the scale when the time comes. I shoot locally more often and focus on California as a long term project for myself which keeps me closer to home and helps balance my time away. Some of you might be interested in how another professional deals with the same topic. A few years ago I had a conversionation with Marc Muench and he was nice enough to share his own personal experiences. He likes to spend at least 4 days because it is enough time for him to be able to get into his flow and come back with some great shots. If he needs to be gone longer it’s usually a week or maybe 10 days and other projects can keep him away even longer so the numbers were more of advice to me. His wife and 3 kids love to go on trips but if he tries to mix in the photography he realizes he wants to shoot longer and the family doesn’t grow fonder of waiting longer. Maybe everyone has their own certain amount of time they like to have while gone in the field? I’m no Dr. Phil but I do know all relationships are different and there is no magic recipe for them so finding balance is key. This entry was posted on February 14, 2011 at 10:57 am and is filed under Uncategorized. You can follow any responses to this entry through the RSS 2.0 feed. You can leave a response, or trackback from your own site. Happy V-Day to you and Christina! Great post for Valentine’s Day. I am in a new relationship. We seem to arrange time together OK because we are both workaholics and get together for limited time anyway. She also has her own business and is therefore flexible to get away and can go with me. I don’t spend as much time in the field on my own photography but do it when and wherever I am. I do travel to talk to galleries and dealers about Dad’s work. It is too soon to tell what may happen when and if we start to get more involved. I would be very curious how those who are in long-term marriages have worked it out. My mother went with Dad on nearly all of his assignments until I was born and then my mother and I stayed home about half the time and tagged along half the time. My mother had passionate interests in learning the flora and fauna, writing the trip logs, etc, and NEVER tired of waiting or ever even considered it waiting because at every photo stop she had plenty of her own activities going on. I sort of emulated her and even as an only child learned to be self-entertained and not need the attention of my father all the time, which allowed him to work. Just to clarify, my father’s work for early environmental organizations took him into the field an AVERAGE of 99 days out of every year his entire life. That is a lot of gone time, but they worked it out. This makes me realize how lucky I am! My husband likes to metal detect, so we have complimentary interests. He spends time looking for interesting things while I photograph. If we go on trips we usually take the camper van and he likes to organize the campsite and tinker with the van while I photograph. He doesn’t really like to travel farther afield, so when I go somewhere that requires a flight, it is actually easier for me because he stays home and takes care of the dogs and I dont have to worry about the dogs being in a kennel. Man, am I ever lucky!! Although there are occasions when he feels like he gets stuck babysitting the dogs while I photograph. Like in Yosemite when the dogs weren’t allowed on the trails and they couldn’t stay alone in the van because of bears. We had to take turns babysitting dogs and sightseeing. California is not very dog friendly. I have been doing photography professionally for over 5 years, but since our son came along in May of 09, I have shelved much of my work. The consistency of my wife’s income has allowed me to stay at home and care for our children, take care of the homestead and keep our lives stress free from trying to balance two jobs while juggling the children’s needs. I am still able to keep my business, but it is in a dormancy stage for now. It will probably stay this way until Jerald starts school, and even then, I can never immediately earn from photography what my wife makes as a controller. It would take several years to build the business to that extent, but we all know it has ebbs and flows, where as a regular job has the consistency of income. Our agreement for now is I get out at least every other week on my own, but only locally. I will have two to three photo trips a year, but family may end up coming along. At least one solo trip is in the cards. That is my “refueling” trip. I long to be out as often as possible, so it is a matter of sacrifice, but it is worth it! Just thought you’d like to know that with a wife & 2 little girls at home, I try to keep my trips to a maximum of 10-14 days in length. I’ve stopped doing shorter trips close to home. It’s just too hard to be gone and then gone again when I am supposed to be at home. I’ve done a few trips that were 21 days with mixed results. My recent trip to Patagonia made me realize that I could do 28 days pretty easily. I’m not going to do that every month, but I am pretty sure that I’ll do a month long trip in the next year. The further you go, the more that you should spend the maximum amount of time there. Just my opinion but if you start having kids, it might be best for the family in the long-run to scale back the photography at least for the first crucial years because that could shape your relationship with your kids for the rest of your life. It’s not a surprise that most photographers have higher than average divorce rate. You said steve…. 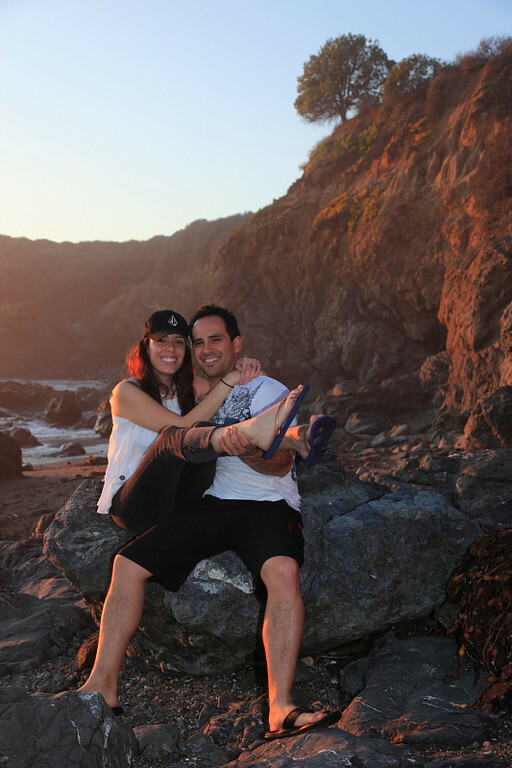 BALANCE (is) the Key to our Hearts and Soul…. I’ll add my $0.02 that balance is the key. My wife and I have a 3 year old son and while they both love being in the outdoors with me, they don’t have the patience I do to wait for the light. Thus, if I want to do serious photography, I go by myself. Not being a full-time photographer, I can sneak out several days a month, but overnight trips are limited to once every couple of months and are only ~3-4 days long. In all honesty, though, that’s long enough because I miss my family by then. Having kids changes you…its like flipping a switch in terms of outlook. Not in a bad way. It helps to have a significant other who is very accommodating. My wife is usually pretty amazing at taking on the extra burden when I’m gone, or allowing me to sneak off for a few hours on “family” camping trips. I think your photograph in the header is simply wonderful, Steve. What a great valentine! Great Valentines Day shot, Steve, might have to steal the idea next year! My wife is really helpful when it comes to getting me out and about. We’ve found that backpacking is the best way to go if we want to combine together time and photography. We have all day together, but she knows that during the magic hours I’ll out where I need to be. She doesn’t care much for hiking in the dark (especially off trail! ), so if we’re taking a trip together, we plan to camp in photogenic areas; if that won’t work for me photographically, I go alone and save us both a lot of logistical hassles and frustration. Mat, Happy Valentine’s Day to you and your wife and new son! In California one full day of driving or less can get you to so many different ecosystems. This may be why I don’t fly much. Well isn’t this a familiar topic for so many of us. Obviously I failed at the balancing part as I am awaiting my final divorce papers but I think it all worked out for the better. It’s a selfish lifestyle and we are required to compromise sometimes. And sometimes, it is just not worth the compromise. Or maybe I’m just more selfish then most… But my light at the end of the tunnel came in the form of someone who gets my creative juices flowing and inspires me. I still crave solitude but so does he. I know that this new relationship will require a balancing act but hopefully it will be easier since we both love photography. David, I’m glad to hear you’re in a new relationship. You’re dad was gone quite often, 99 days is considerable amount of time. 99 days away probably kept him pretty busy once home with all out of the field work. Anne, You certainly are lucky to have someone that will get out there with you. I never want Christina to get board out there but she does get pretty board while waiting for me. You’re right about California not being so dog friendly. Some of the hotels have changed their pet policies to encourage more guests to stay in this ecomony but that’s something that has changed recently. Before it was very difficult to find a pet friendly hotel at an affordable price. Many of the State Beaches do not even allow a pet on the sand. Mark, I could see trying to get your son into one of those kid backpacks on your back but I’d imagine he’d pull your hair out if you kept him in there too long and the minute you let him out of it he’d put anything and everything he could find on the ground in his mouth. It’s very tough to compose a scene that way. You’ve got me thinking I should stock up the hard drives so once the time comes I’ll just process images more then I’m shooting. Thanks for the thoughts on this. Jon, those trips to Patagonia are probably spent waiting much of the time on those high mountain clouds to clear up. To travel that far it’d be tough to not stay as long as you can. Down here I can be just about anywhere in about 4 hours so I can easily come back soon if needed. Richard, I agree with you on developing the bonds with your children while they’re young. Greg, There is definitely an allowed amount of time which varies between most couple for each others hobbies or just time away. The longer the trip is the stronger the smell of outside you bring back home with you, even with showers. Jackson, I connect with you here a lot because Christina won’t camp next to the car, she’d rather stay in a hotel. She will backpack long distances and doesn’t seem to mind it much. Keeping our women occupied must be another key. Aleks, I think since you and Jesse are both into photography it will be easier to play your cards right. It would be interesting to what works and doesn’t work with you two. These are the mountains of our lives! J/k maybe a reality TV show? Not enough of the population is into landscape photography to make it onto mainstream TV. Geoff, good luck with the baby on the way. I’m sure it will work out for you. There’s always wildflowers in the hills behind Moorpark. Hey Chris, yes she did like and so did her friend that was engaged to one of my friends. 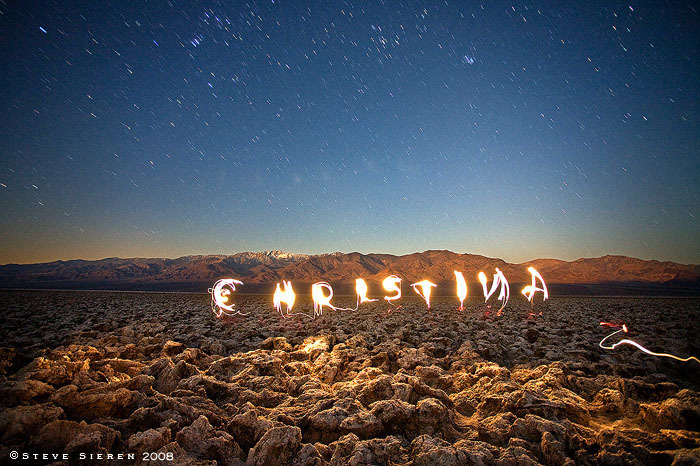 Her friend wondered if she could get my friend Phil to go out into the desert and write her name in sparklers under the stars. Christina has kept this as her screen saver ever since. It is beautiful… I love it. I know Christina probably still has it on her screen saver. Great work,Thanks for sharing this post with us.keep it up.